Are you looking for new ways to advertise or promote your shop/site? There are several opportunities available at Satori Design for Living including monthly sidebar sponsorship, giveaways, product reviews and more! You can check out the Sponsorship page to inquire about any or all of these opportunities. NEW! Starting this month, I’m seeking and scheduling shops for a new sponsorship opportunity called Fab Find Deal. Every month, I will do a post that showcases up to four shops that provide a discount code exclusive to Satori readers for one fabulous product or the entire shop. Fantastic deal this month on Aya Designs! Aya’s shop has beautiful jewelry pieces handcrafted with the best quality stones, pearls and crystals. Enjoy 30% Off the entire Aya Designs online shop by entering coupon code Satori30 at the checkout. Ends May 31, 2012. Note: Aya volunteered her shop to demonstrate how Fab Find Deal will work in the coming months. The coupon code is indeed valid for Satori readers, so be sure to take advantage of this opportunity and start shopping. Thank you Aya! If you’re interested in reaching a new audience and partaking in an upcoming Fab Find Deal, please contact me for more information. I also want to remind you to get your posts ready for our upcoming Outdoor Extravaganza. 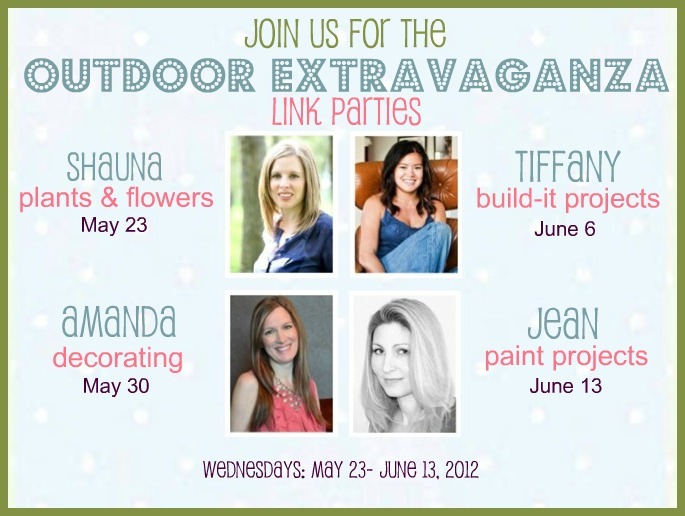 I can’t wait to see everyone’s outdoor projects. I need to get busy!